Sunterra Meats was purchased from a local group of farmers in 1990. The plant focuses on pork processing and combines the benefits of modern, humane processing techniques and highly skilled staff with an internationally recognized food safety program (HACCP) to deliver an uncompromised meat quality. Sunterra has a simple philosophy: to achieve the meat industry's highest standards, and provide the ultimate in customer service. The philosophy may be simple, but delivering on it takes a lot of dedication. 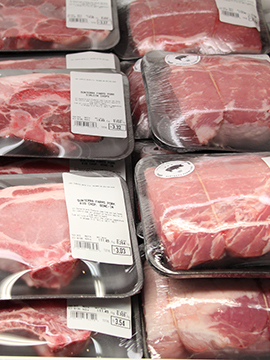 Whether it is shipments to large overseas accounts, to retailers from coast-to-coast or deliveries to our own fresh food markets, our success is in the fresh meat business. The same technology utilized to deliver high-quality fresh meat to Japan for over 15 years has focused our producers, plants and transportation providers to continual improvement in all areas. As a result, our products are delivered to our customers with optimal shelf life to the industry's highest standards of safety. With a proud history in farming and animal husbandry, we take animal welfare to heart. Our livestock operations ensure animals are treated humanely, utilizing the latest in production technology, nutrition and animal health. From birth on our farms to slaughter at our plants, we take care that animals are treated with respect. Efficient and humane slaughter minimizing pre-slaughter stress is also critical to producing top-quality meat products.